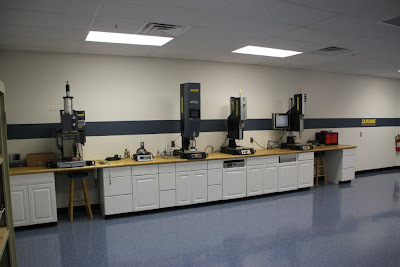 We invite you to come see us at Dukane’s Automotive Technical Center in Wixom, Michigan. The place has taken on a new, refreshing look, and really shines! A recent upgrade to the facility coincides with some milestones for the company: 5 years for the Wixom Center, and 90 years for Dukane Corporation, St. Charles, Illinois. What a great way to salute the firm that has been providing innovative assembly solutions through its outstanding equipment and worldwide network of highly qualified experts. At Wixom there’s a welding lab showcasing the latest Dukane technology in its full line of welders. We have the most recent additions, the iQ Series ultrasonic press systems, and hand probe units with their best-in-class ergonomics. You will also find systems that demonstrate Servo Spin welding, Thermo Press for heat staking or inserting, and Vibration Welding. Especially impressive is our Model VWB 4700 vibration welder, which is capable of handling a large range of part sizes. Model VWB 4700 vibration welder capable of handling a large range of part sizes. The lab itself features an acoustical tile ceiling to keep things quieter, and the environment is temperature controlled, so the lab can be easily used year round. The staff in Michigan is ready to assist with your next project – from concept to build. Services include commissioning welding equipment for launch at customer sites with Dukane’s expert resourcing available for each step of the process. The Tech Center offers its expertise not only for automotive applications, but for other markets as well. 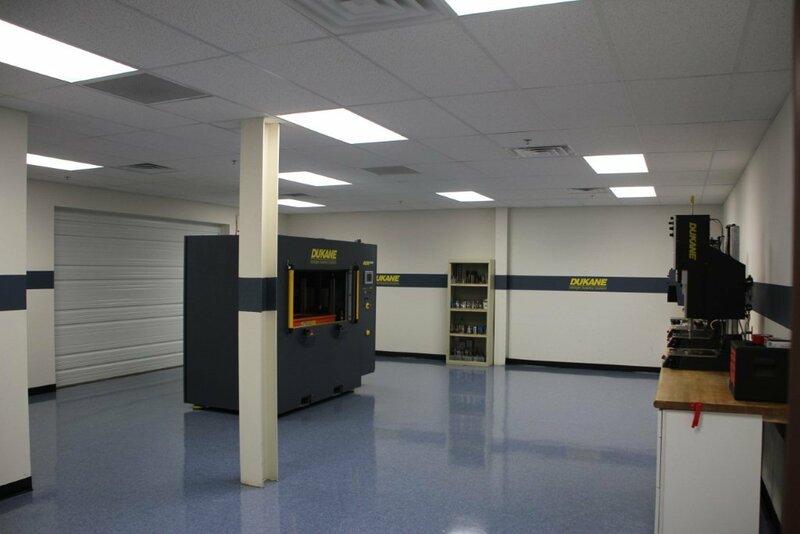 Wherever parts assembly solutions are needed, Dukane can offer its wealth of knowledge combined with an advanced line of hardware and software to meet the most demanding requirements. Stop by the Tech Center, 47757 West Road, Suite C101, Wixom, Michigan.